We don’t need as much inertia in the power system as many think, and with a few simple changes we won’t need to mandate inertia limits either. Here’s why. What does inertia have to do with controlling power system frequency? Some carefully selected analogies might make the reasons for this clearer. Is it easier or harder to control the speed of a motor cycle or a heavily loaded truck? Most people would correctly surmise that it is easier to control the speed of a motor cycle because it has less inertia – but we are being told by various reports (e.g. The recent Finkel review into the Australian National grid, and prior reports released by AEMO etc.) that we need to place limits on the minimum amount of inertia on power systems. Is this emphasis on inertia misplaced? I believe it is. Objects with large inertia want to keep moving (or rotating) at the same speed and as a result it needs large amounts of force to slow or speed things up. AC power systems are designed to operate at a constant speed, we sometimes refer to this as “frequency”, but this translates directly to the speed that rotating devices such as motors or generators operate at. Therefore, the degree to which external forces can change the system frequency is inversely proportional to how much inertia is on the system. So, the reasoning goes, if you want constant system frequency set up the system have as much inertia as possible, this means it takes more force to change it. This simplistic approach seems to me to be misguided. If implemented it could place onerous restrictions on the connection of renewable energy sources, in particular power stations of solar photovoltaic design which have no rotating parts and hence no inertia. Perhaps we should examine this industry wide preoccupation with inertia a bit more critically. The reason controlling the speed of a motor cycle is easier than controlling the speed of a truck is due to the responsiveness of the throttle/engine combination. Although a truck engine is more powerful than that of a motor cycle, the power to weight ratio is typically much less. This allows motor cycles to accelerate much faster than heavily laden trucks. It is not inertia that allows constant speed, it is the effectiveness of the throttle/engine combination, the effectiveness of the control system. In power system subjects, the terminology for “throttle” is “governor” and “engine” is usually referred to as “turbine”, although this depends on the details of the actual technology used to drive the generator. So the main thing that controls the speed, (which is the frequency) of an electrical power system are the governor controls. Most of the points I want to make in this blog have already been made. The discussion below will be a slightly more technical and will include a few equations which will turn off some readers, but I hope you will persevere because the technicalities of an issue sometimes matter. For experts in the subject the discussion below will be too simplistic but I ask them to remember that this is a blog, not a textbook. In power systems theory, generator/turbine inertia is represented by the symbol H. The relationship between the power mismatch and the speed deviation is usually represented as 1/(2 H s) , s being a Laplace transform variable. With no governor control system if there is a power mismatch the frequency will ramp in proportion to the power mismatch, and inversely proportional to the inertia. In calculus terms, the output (frequency deviation) signal is the integral of the input power mismatch – the inertia H being the constant which determines the slope of the ramp. Large inertia implies lower gradient ramping relative to a small inertia. Note: – it is not possible to limit the frequency deviation by inertia alone, a power mismatch will cause the frequency deviation to ramp until something malfunctions and the power system collapses resulting in a blackout. To stop the frequency from continuing to ramp, you need governor control systems. The governor measures the speed of the turbine and feeds back a correcting power signal to the input. This is a well-known technique for control systems and is used in virtually every technology you could name, e.g. process controls, electronic amplifiers, aircraft, space craft, steam engines etc.etc. Translating the math to physics means the governor limits the frequency ramping – depending on the governor design parameters this can be made to return the frequency to its original value (this is known as isochronous governing), or just to limit the final variation to a finite amount. The point of introducing the control system algebraic formalism is to show what happens if the inertia is made smaller. Below I have created three arbitrary systems and calculated the response of each. The only difference between the first and second cases of calculated simulations is that the assumed inertia is halved in the second case. For the third case I modified the governor parameters to change the response of the second case. As you can see, whilst the frequency initially changes more quickly in the second case (lighter inertia) the frequency excursion is slightly more, but control is established quickly and the final frequency deviation is exactly the same. This is not surprising for a control system engineer, in effect reducing the inertia has (in control system theory parlance) increased the closed loop gain. This has the effect of speeding up the response and making it more oscillatory. However this is easily fixed by making some minor changes to the governor responses. We have ended up with a system of lower inertia which has a better response. So in actual fact reducing system inertia and retuning the governor has actually made things a better with respect to frequency control. The mathematics shows it is easier to control the speed of motor cycles than it is for trucks. There are small scale power systems in operation which have effectively no inertia, so in theory and in practice it is possible to design a large scale power system along similar lines. It won’t happen overnight, but it is possible to design and operate a national power system with no inertia. A good project for the 22nd century perhaps. In the meantime we have a system which is changing its inertia as the mix of generation changes. Does this mean the system characteristics change? Obviously. Is it a system security concern? Not necessarily, but it does need suitably qualified power system engineers to keep an eye on it. What needs to be done? Well in the short term we might need to retune some governor control systems to compensate for a lighter system – that is all. An additional benefit is that this will also address many of the issues that the FCAS market has caused relating to the recent deterioration of frequency control. In the longer term we need to ensure new renewable technologies can contribute to frequency control, but this is only important if we disconnect many of the synchronous generators which currently make up 90% of our grid. It is an upcoming issue but the time frame for this is 20 – 30 years, not one. If we do this, we won’t need to mandate inertia limits for various regions of the system. Bruce is an Electrical Engineer and senior advisor at Advisian. This article was first published on his LinkedIn page. Reproduced with permission of the author. Thank you for this illuminating discussion of inertia. I have long thought that the comments on inertia from certain sectors (politicians) seemed misguided. We live off-grid with batteries and an inverter rated at 5 kW continuous (12 kW short-term peak). The electronics in the inverter are able to go instantly from zero to rated load and above without affecting frequency. That’s better than an engine-driven generator. I’ve often wondered why grid-scale renewable systems could not have the same performance as our little system. In theory they can. In practice this will take a long time to achieve. There are two further issues which reinforce your point. 2. A steam turbo-generator has an Inertia Constant of around 9 seconds, a gas turbine 3s and a low wind style wind turbine 4-5s. Inertia Constant of n means that the total rotary inertia is n seconds worth of rated power. Because synchronous generators can only change speed by an absolute maximum of 2% they can only supply (1-0.98^2)= 4% of their rotary energy as useful energy anyway. i.e. a 250MW gas turbine can supply the equivalent of 10MW for 3 seconds or around 30MJ. Thanks Peter. That is correct and I understand that this is implemented on wind turbines fitted with virtual inertia. There is an energy cost that must be bourne when reaccelerating the turbine. That is true and the more energy you give up the longer the recovery time. This also applies to any inertial response whether it is gas turbines steam turbines synchronous condensors or whatever. As Steve says above batteries or wind or solar plants running below peak output can supply response much faster than any thermal plant. One further problem with gas turbines is that as frequency falls compressor pressure drops by the square of the speed so a 2% frequency drop means a 4% output drop. So the governor response has to recover both inertia and power fall. Depending on the both the control system and thermo-mechanical time constant of the machine the energy lost to the system from the power reduction may be much greater than than energy contributed from inertia. If the grid is close to the limit the negative power response of gas turbines actually increases system losses and can lead to cascading failure. Such negative disturbance response does not happen with wind, solar or hydro and is unlikely with steam plant. thank you Bruce for this very useful explanation of inertia in the power system. Inertia is not the problem. The problem is frequency response. Most solar inverters are set up to deliver maximum output of their PV into the grid and therefore have no frequency response at all. This means that when load on the grid varies, the solar inverters continue without change to output. The existing thermal and hydro (rotating) power stations must take all the load change. As the amount of renewables increases and we have less rotating capacity on the grid, the size of load changes per unit (PU) will increase for each generator. Ultimately, if there is only one rotating generator on the grid it will be taking all the load changes. So, we need to have the facility for solar and other renewable inverters to take a share of the load changes. This feature will change the output of each inverter with frequency and implies each inverter will be running at less than 100% during normal operation, but available to increase or decrease output in response to frequency. Adding batteries to a renewable resource will make this easier. Mathematically this is a governor response to frequency, not inertia. Traditionally inertia has been useful to bridge the gap until governors could add power to the turbines. With static inverters providing much or all of the generation, we will not need any inertia because the static inverters can respond within milliseconds. However we do need these static inverters to be capable of responding to frequency, both increasing and decreasing. Thanks Steve, I agree with your summary. What you say is true and as the renewable share increases it may become necessary to run both solar and wind inverters at 95-97% capacity just as there are always a number of thermal/hydro plants running below capacity as spinning reserve. However the amount of “wasted” capacity is much smaller because the ramp rate of the inverters is much faster than gas or steam plant so less idle capacity is needed. a) because even a small amount of storage would allow them to participate in relatively lucrative, 6 second, one minute and 5 minute raise markets. But the operation of the grid is not based on all generators chasing the load and adjusting their output to maintain frequency at 50.00 Hz. Others are assigned to control frequency and some are assigned with spinning reserve. Usually the frequency controllers also provide the spinning reserve. From a market perspective, all of these generators get paid to participate in the market ( in WA at least as a capacity credit) as well as get paid for their output ( spot market price or contracted price) and those allowed to participate in FCAS get paid for that service as well. Its not a matter of all generators that are connected to the grid having to adjust output to maintain system frequency. Only exception to this is when you have a significant network event which is usually the loss of a large generator of source of generation where you end up with a shortfall of generation to meet load demand (frequency goes low), or a load rejection event due to a fault on the network, where you lose load and end up with a surplus of generation ( frequency goes high). In these circumstances additional generators other than those controlling frequency or providing spinning reserve may have to adjust their output for the duration of the disruption before the system is brought back into equilibrium. You have it right as far as you have gone, but you have not gone nearly far enough. Just imagine a 10,000MW system with say 10 conventional machines generating. A 500MW (say) machine trips. What happens? First, in the network voltage will fall. This will be corrected by the voltage controllers on the generators. This will also give a power boost for a short time. The frequency will start to fall. The governors on each machine in the network will start to open the throttle valves. A feed forward signal will go to the boiler controls and start firing the boilers harder, but the boiler pressure will start to fall in each machine on the network. Over time, machines with spare capacity will load up and any quick start machines ( eg hydro) will start. Slowly the frequency will rise, but only after 500MW of generation has been raised to replace the 500MW that was lost. To all but those involved, the network carries on as usual. Without inertia, the frequency would fall much faster and people would notice. That is why AEMO has a price for 6 second raise, 1 minute raise, 5 minute raise etc. The new technology can be so fantastic – large batteries can provide load in milli second not seconds or minutes. Non synchronous wind turbines can be slowed down much more than the system frequency and therefore contribute inertia. System modelling which you have just put your toe into is complex. You have to model the generator transient, sub transient and static parameters, the voltage controler response, the governor response and the turbine response for each machine in the network. Add in the impedance of all the transformers and transmission lines and you have a very large model. There are a lot of very clever people doing this all the time. Don’t diminish their work carelessly. System modelling is a highly specialised field. If you want to dip into it, there are many good text books out there. “Power System Stability and Control” by Prabha Kundur published by EPRI is a readable text, have a look at it, but be ready for over 1000 pages of high level maths. Enjoy. It is a great subject. Thanks TW for your considered response. I am flattered you think I am clever. Well Bruce, you are clever and so are all the guys, who are commenting on this subject here. I personally can’t add anything to this discussion, except to say, that I didn’t think a high renewable grid, especially with storage was ever going to be a major problem going forward. Clearly the answers to the problems are forth coming. I enjoyed reading your blog, but yes the maths, as you warned are definitely not something that I understand, as unfortunately for me that area of my brain never developed that level of capability. Perhaps a refund is in order LOL. However, as I design and install grid and off-grid SPS systems, I fully understood everything else. Ditto. ( what he said). And we need practical people who construct and install these systems anyway so I think you actually can add plenty to the discussion with real feedback on coal face ( excuse pun) knowledge on how an installed system works and performs, which comes back to good design and understanding of actual conditions on the ground. It is worth noting inertia is mostly used in short term (seconds) response to large loss of single synonous generators. You could argue if there were smaller wind or solar farms the need drops. Loosing one 3mw wind turbine doesn’t seem to cause much problems.. Transmission outages also leverage inertia but are usually redundant and therefore not as common. And they usually have both the affects of over and under frequency. Too much inertia has a negative affect on managing over frequency. If wind and solar farms don’t output 100% of available capacity they could provide synerthic inertia. There is an obvious cost to do this to these gens. As can batteries and demand response. I understand wind and solar are frequency followers, it will be interesting to see how they can set the frequency when there is a large proportion on the grid. I don’t fully understand how you can maintain supply and demand on the grid under such conditions where frequency is artificial. Perhaps we need to rethink the use of system frequency to balance supply and demand. Very considered answers in this discussion but I have some questions. Why can’t the provision of ‘inertia’ be split into 50Hz plus correction and into 50Hz minus correction. Wind turbines are most cost effective when running at full available load most of the time. These can be off loaded and the wind energy throttled back occasionally when load drops. On the other hand, batteries and inverters can inject more energy into the system when load rises. The second question is this : an inverter requires a source of energy to drive synthetic inertia, usually directly from solar panels or from batteries. Is there any reason why an inverter could not derive its energy input directly from the grid it is trying to stabilise? Thirdly, the whole problem of grid stability can be traced to matching energy input with energy output. TW gives an example of a 10000MW grid, the typical distributed solar generator is 5KW. Each system will face a huge monolithic pool of electricity. There might be 2 million of these connected to the grid. How is the mass of these to adjust output to stabilise the grid? Has anyone modelled such a scenario? Splitting inertia – in effect this is already being attempted by having different raise and lower FCAS markets, but in my view these have not been very successful. Investor deriving power from the grid – in conjunction with energy storage this can be and is done. Without energy storage you effectively have a “pulling your self up by the bootstraps” issue. The more power you take out of the grid in order to put it back in is like setting up two opposing forces. Matching energy input with output – I understand people are looking at aggregating solar PV to make it centrally controllable, there are issues with communication delays etc but in theory and in practise the technique appears to be a valid approach. Thanks Bruce for the post. Inertia is an artifact of last century power engineering and maybe belongs in a museum. It is becoming very clear we need to be allot smarter at managing our energy system and drill down into the fundamentals of the whole system. Every element from all the small loads to the largest rotation machine all have various characteristics and behaviors, including the important temperature sensitivities. We urgently need the quality engineering to inform and guide the future. What is possible today was not possible yesterday. We are adding 100’s of MW of load and generation to the NEM each year but no one is looking at the opportunities to add extra system value at largely no cost. So is a better option to install electronic inverters and battery system at all substations (using the same design and mass produced to lower the cost) to provide a range of power quality, security, phase balancing and backup functions working in conjunction with the local loads and coordinated by AEMO? Thanks for your comments Ray. In future (maybe 22nd century) we may have electronic inventors or their equivalent virtually everywhere. However this would require a large economic investment which I think may happen, but only if there are sufficient economic drivers to make it happen. My backup inverter and battery system, be it small 500VA provides constant 50Hz, 1500VA+ of surge with voltage regulation and low harmonic distortion. Anyway your idea to question the status quo is good, many of our engineers have become very lazy and with little to no imagination. They have been very complacence, seem to wear blinkers all the time while the world in changing rapidly around them. Hopefully they can see the many opportunities presented and start to solve some of the real problems instead of just complaining and finding excuses about change. I’m not convinced you don’t need the inertia going forward. ?? Frequency control is only on of the parameters that needs to be considered. Network faults cause a lot more disruption to a system than does generators tripping off. Depending on the electrical angle in the system and the fault location plus the location of generation relative to the fault, it is possible for the network to decouple and go out of synchronism. Diesel generators tend to be very tolerant of frequency deviations and fault events compared to gas turbine or steam turbine generators. Isn’t this directly related to their inbuilt inertia? I picture your motorcycle that can accelerate and decelerate quickly but that diesel powered prime mover will keep ploughing ahead when the going gets tough and the bike has stalled. Isn’t that torque = inertia? And this constant reference by ill informed pollies to ‘synchronous’ generators like they are something special. All generators connected to the grid need to be ‘synchronised’ or you have catastrophic results !! ( I guess the exception being wind turbine generators that are synchronised to the grid via their inverter). So if someone can explain how and why synthetic inertia can replace rotational or dynamic inertia I would be interested to understand this. Hi FeFiFoFum – you are correct in stating that there are other concerns than just loss of generation. We also have system faults etc to consider. With respect to your queries on synthetic inertia, that is a subject worth several articles which hopefully I will find time to write. In the meantime though I will draw your attention to the ESCRI project which is due to be commissioned early next year. This will use battery storage to provide a grid reference for residential load and hence will have only nominal inertia. This will demonstrate several principals in practice on a fairly large scale ~ 5- 10 MW which so far have only been talked about in theory. Checkout the attached graph from the AEMO final report on the SA September blackout last year … page 55. 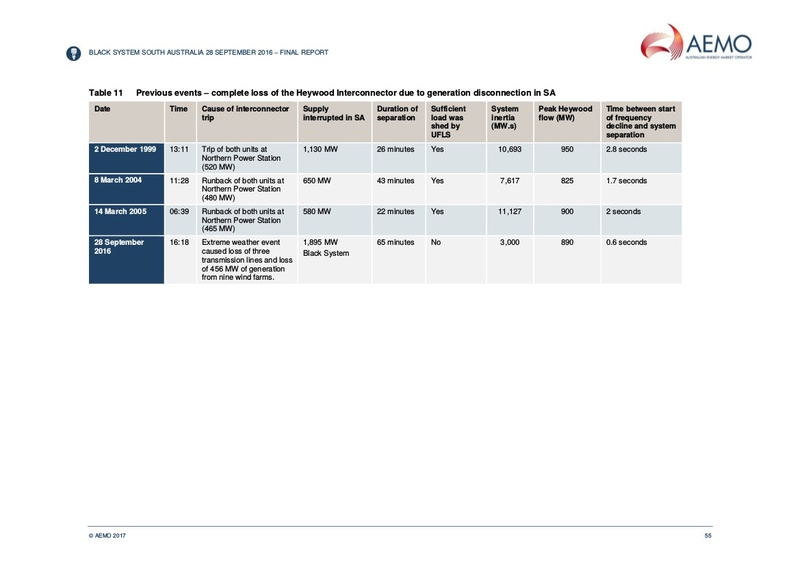 SA had 3 prior losses of her interconnector with Victoria as a result of major generation failures … but with about 7000 MWs of inertia, the frequency dropped slowly enough for the load shedding mechanisms to kick in. But thanks to increased wind penetration, we only had 3000 MWs of inertia and the frequency dropped far too quickly to allow load shedding. That was the real world; the one which matters. At present renewable only advocates want us to bet the planet on the technology that failed last time it was tried … meaning when renewables were rolled out back in the 70s and 80s in response to the oil crisis. Happily nuclear saved the day back then and has been saving lives and reducing carbon ever since. Pretending that inertia isn’t a tough complex problem to solve and that we don’t need much is not helpful. I’d be pretty sure that RE readers don’t generally read engineering research and some might even think that RE is some kind of authoritative resource. Hi gjrussell – thanks for your comment. However I respectfully disagree on some of your finer points. Frequency did drop faster in the SA blackout event but this was not just due to lighter inertia at the time – it was also due to a lack of governor operation caused by lax frequency regulation and FCAS market failure. In fact – I believe that if frequency control had been tighter and if tie line control across the Heywood Interconnector was working then the blackout could have been avoided despite the collapse of about 20 transmission towers. As to pretending inertia is not a tough complex problem, I don’t believe I have implied any such thing – just to opposite. The whole point I am trying to make is that inertia is only one aspect of the problem – the control system design and operation also has a large bearing on the issue, in fact it is the main thing controlling system frequency. Mathematically inertia is just a single parameter in a complex system, if we place artificial limits on inertia without considering the rest of the system – then the system will fail and the lights will go out. I’m not suggesting that engineers can’t find an alternative to large spinning generators to provide frequency control. But it’s a task that’s been ignored … and the blackout was the result. People just kept plugging in wind farms which provide no inertia and expecting the system to be magically robust despite the changed characteristics. And then they had the nerve to claim that high wind penetration was irrelevant. Actually in many ways the system is more robust with wind farms than it was without. On the day of the event there were six faults in close succession – any transmission system would have struggled and probably failed under those circumstances. When things go wrong on power systems they go wrong very quickly and operators can only stand by and watch. The only way you can protect systems is by configuring them prior to the event so that if a failure occurs the system can respond and still survive. Some of the things that could have been done on the day to prevent the system black ( its easy to be wise after the event) was to run the interconnector with more headroom and enable governor control systems inside SA to respond to frequency changes. Both approaches did not occur because of Market design and operation. The SA blackout was a market failure as much as it was an engineering failure. I provided evidence of much bigger outages that didn’t result in blackouts but you insist that the system is more robust now … clearly it isn’t. If by evidence you are referring to the table at the start of this thread – I disagree. In all those prior instances the system was configured to survive a large loss of generation – in the black out event it wasn’t – hence the failure. Blaming the blackout on low inertia is a cop out in my view – it is like blaming a car crash on a tire blow out and ignoring the reckless driving leading up to the crash. Fair enough. The reckless driving in this case was installing large amounts of wind without doing the required engineering. Presumably because nobody had the nerve to tell the politicians that it isn’t as simple as just building more turbines. @Bruce Miller: Interesting analysis but you got some things wrong! The electric power grid dynamics cannot wait for the turbine-governor control to act, otherwise it would collapse. Thus, grid inertia is of utmost necessity. When system load increases (‘under-frequency’), stored kinetic energy must FIRST be released to initially supply the needed power. It is after then that the turbine-governor control can kick-in to raise the mechanical input torque. This inertia response (of stored kinetic energy) is a matter of milliseconds reaction to transient event which the turbine-governor control, as of today’s technological advancements cannot achieve. In the case of decrease in system load (‘over frequency’), the inertia would not of much help and the turbine-governor control is needed. Here, you may be correct to say the system inertia is a disadvantage with the analogy of the ‘motorcycle and heavily-loaded truck’. I feel that this is slightly misleading information and here are my humble views. Kindly accept my apologies I have misunderstood the article. The whole concern about reduced inertia has its roots in replacing the conventional generator systems with the RES, and when these generators are replaced, there is no question of governor action having any role in the power system frequency control. So the future project of 22nd century that you mentioned may never see the light of the day, as there won’t be any fuel/steam/ etc. powered generators in existence, and all the generation will be via RES. Also, the second point is, having reduced inertia is never a problem. The problem which slipped from your discussions above was of ‘Deep Frequency Nadirs’. So as you demonstrated the graphs for the frequency response, the system with low inertia, will have a deeper Nadir, which might trigger the activation of the Underfrequency relays creating subsequent drop in frequency and ultimately a catastrophic blackout. It is important to understand the severity of the problem and search for the alternative solutions for the sources of the inertial energy rather than discussing about how it is not a problem. As the conventional generators are replaced by RES, the kinetic energy from these generators’ rotors’ is no more available, creating the problem of frequency excursion at rapid rate. With respect, but it is time to look turn out one of the many Power System Reliability text books and look at the equations. You will find a book full of maths. Once you have understood the equations, purchase the system model and start doing some investigations. You will find that AEMO know what they are doing with system modelling. Inertia, whether conventional or synthetic, is vital during system faults and disturbances. Riding through worst case loss of large blocks of generation, loss of transmission systems, arcing failure of plant or the loss of blocks of load is essential for a reliable network. Inertia of some form, VAR generation ( voltage control) and the ability to supply fault current is essential for the network to survive, remain synchronised recover. All it takes is a lightening strikes or a plant failure etc. On the network as a whole, these are regular occurrences not noticed unless you have high speed system monitoring. Either accept the technical explanations or get into the equations. Otherwise you are guessing.